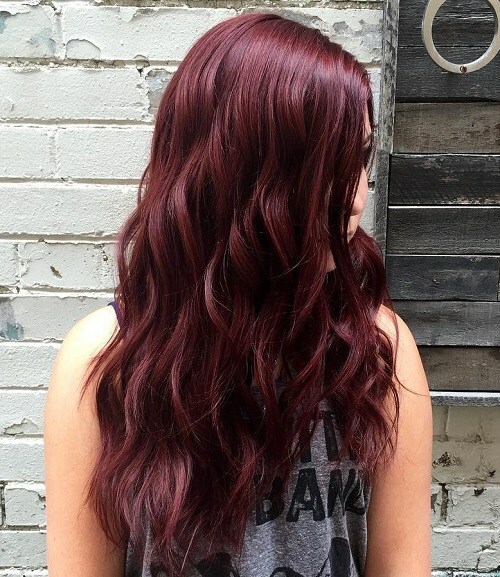 Mahogany is one of the very few hair colors out there that really does suit every girl. Perhaps this is because this sultry shade combines the best of both warm and cool undertones. 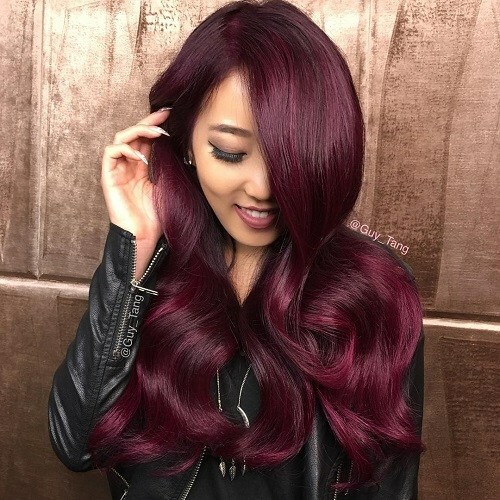 On the one hand, the violet tones which can be hidden among the more vividly red mahogany hairstyles are great for girls with cool complexions or anyone who just wants to make a striking statement with their image. Then, of course, there is the more understated and natural side to mahogany hair. Mahogany is, after all, an exciting shade of brown which is sure to freshen up your brunette look and add some serious pizzazz and style. 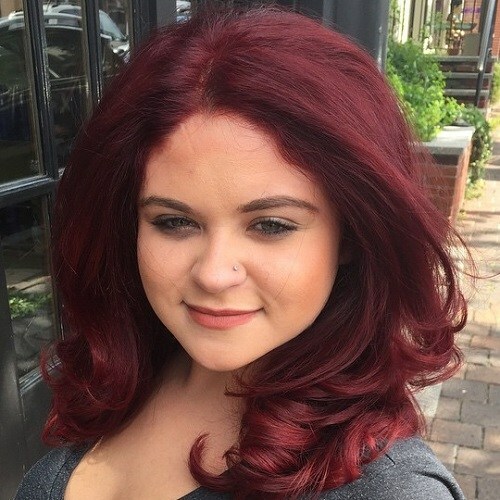 One thing you can always rely on from a hair color which includes both red and brown is that it will leave your hair looking gorgeously healthy and glossy. This means that you can wear your mahogany tresses in just about any style you’d like and feel confident that you look great. 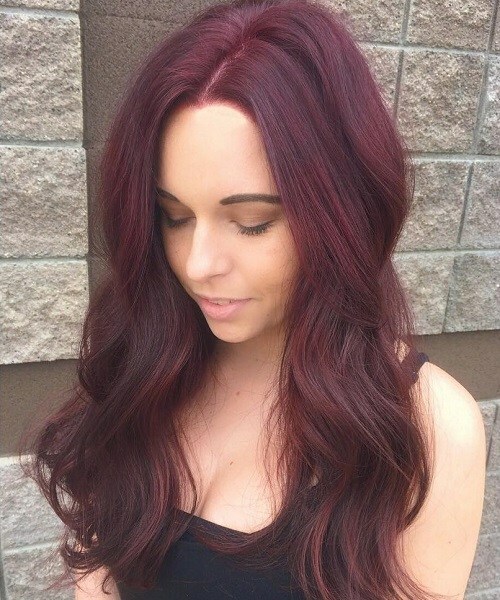 Girls with naturally black hair often make the mistake of thinking that their hair is too dark to dye, so they miss out on experimenting with fun colors. 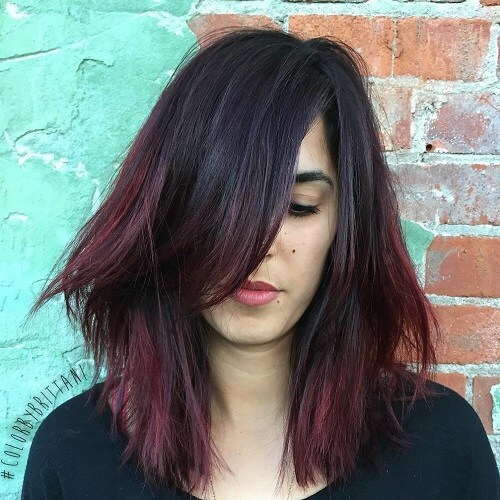 However, red is one of the best colors for brightening up jet black hair, like this graduated bob, without causing long lasting damage. The long bob or ‘lob’ is one of the trendiest hairstyles around. The length is chic and flattering, charming and feminine. The problem with such a fashionable haircut as this is that you might be in danger of blending into the crowd. Make the look your own by opting for a slightly graduated A Line shape with beach waves and mahogany highlights. This jagged hairstyle is ideal as it can be worn wild and backcombed for an edgy look on nights out, or it can be styled simple and straight for work or formal occasions. 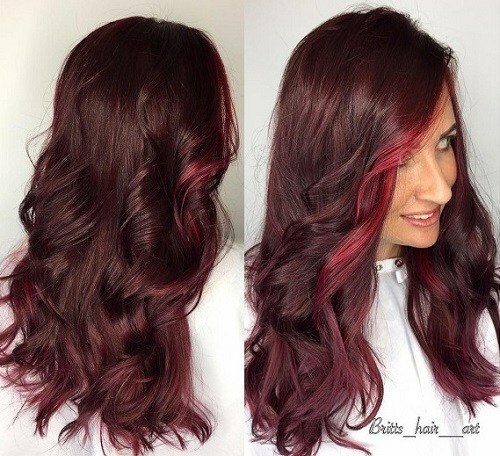 The deep scarlet ombre running through the layers is just the right amount of rebellious for rock chicks that have serious day jobs. Remember how earlier on we mentioned that mahogany locks have the potential to look totally understated and demure? 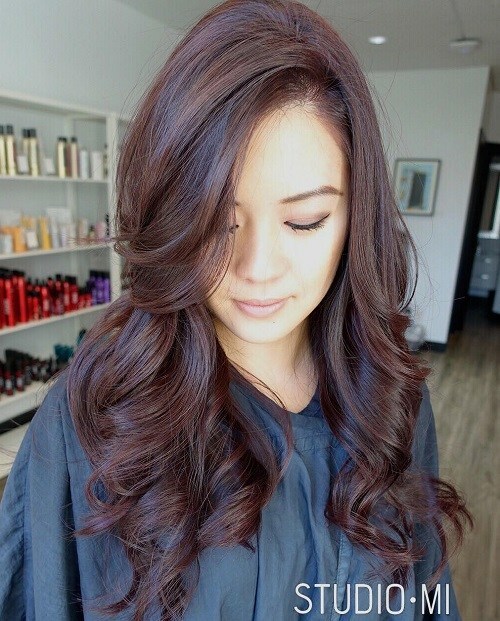 Here is a perfect example of how a light shade of mahogany brown looks incredibly gentle, especially when teamed with classic waves. 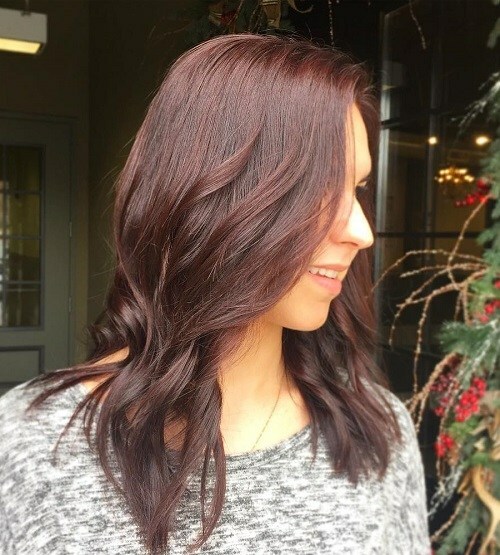 As if gorgeous spiraling curls on a mid-length bob weren’t vivacious and bouncy enough, this model has added a whole new lease of life to her look by trying out two tone mahogany balayage. The combination of browns creates a delicious chocolate effect which looks good enough to eat. If you want to keep your look natural yet striking, then an all-over mahogany shade is ideal for you. 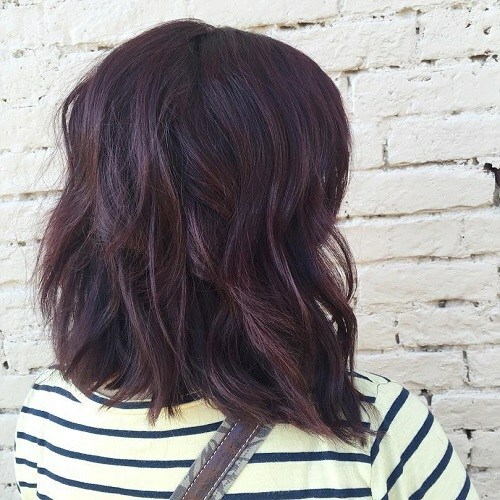 Worn on a simple bob like this one, this shade will leave your locks looking glossier than ever. If you’ve got a special event coming up soon and you want to look your absolute best, this look is the one for you. 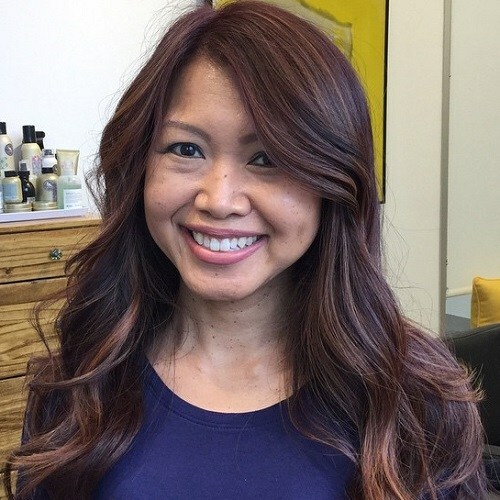 Ask your stylist to give you a side part with Hollywood-esque curls and brighten up your chocolate brown shade with subtle undertones of violet. 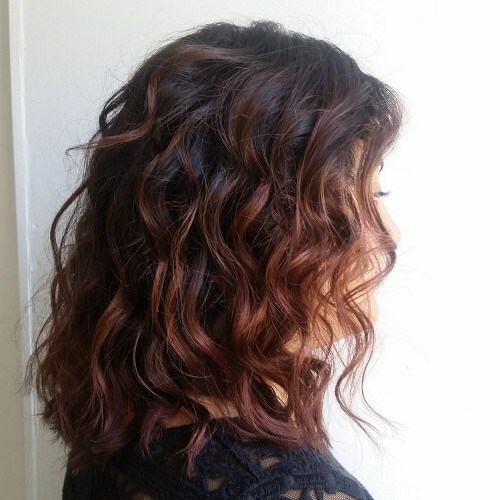 For a softer touch of mahogany, try adding it in streaks of balayage through prettily curled hair like this. 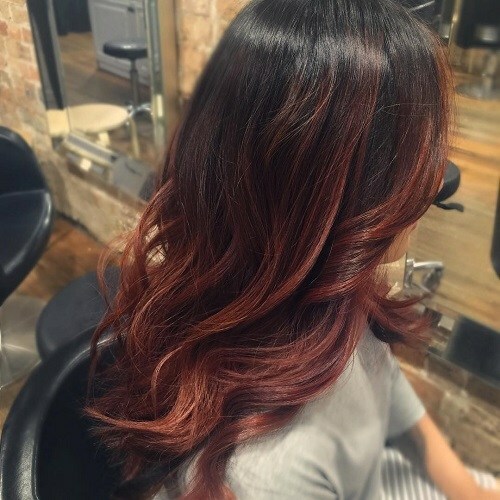 The reddish brown balayage stands out just the right amount against the super dark base tone, making this a look that even the darkest haired girls can enjoy. Something about this hairstyle reminds us of Ariel from Disney’s The Little Mermaid, with a modern twist. The bold shade of mahogany is the perfect combination of vibrant and subtle. If you’re lucky enough to have super long waves like these, this is the perfect look for you. It’s hard to imagine hair looking silkier or softer to the touch than this. 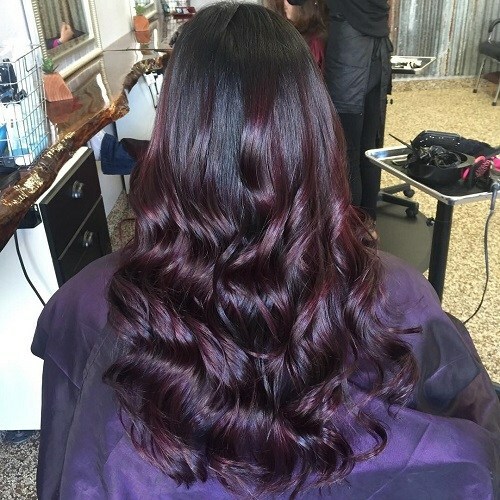 These long, flowing waves look absolutely perfect, especially when worn with such a vivid shade of plum red. This shade of dark mahogany is perfectly paired with naturally jet black hair, and will be incredibly complementary on girls with dark complexions. The soft curls in the length show off the color and shine to their very best. Light mahogany with subtle highlights throughout is an incredible new look for the summer. Team with soft curls to achieve a look that is gorgeously soft and girly. 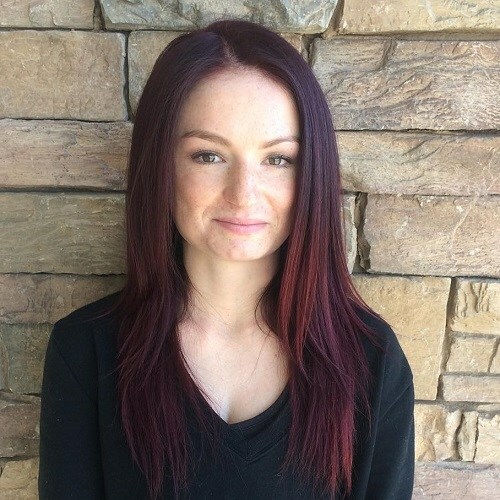 One of the most stylish ways to flaunt your mahogany hair with dark crimson balayage is to wear it in a poker straight style. This is about as sleek as it gets and is sure to leave you looking and feeling more chic than ever before. This look shows off how beautiful sleek and straight hair can look with a softer shade of mahogany. 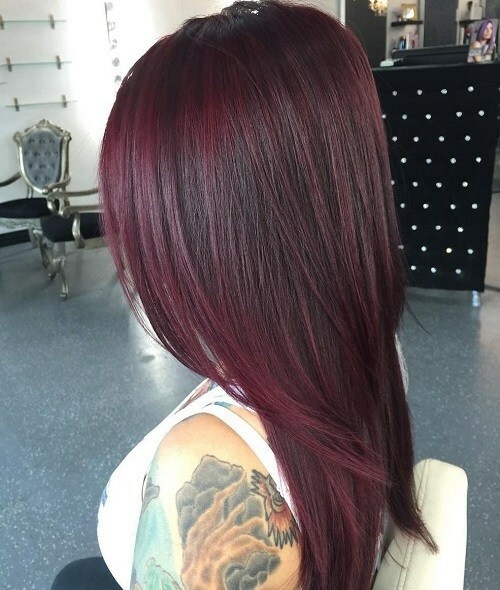 Here, the model’s hair starts off a deep shade of brown and gradually fades into a sweet cherry red. With a wide barreled curling iron, you can create a look that is fit for a fairytale princess. 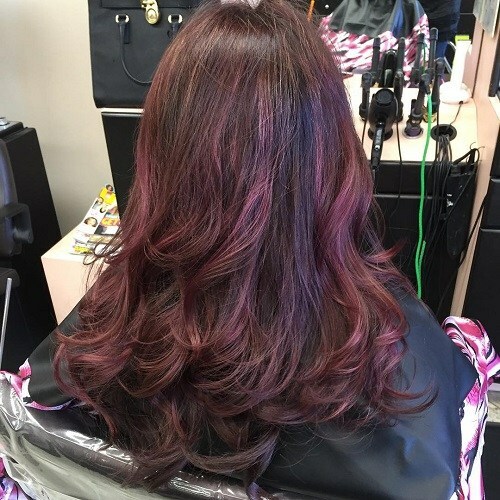 From those bouncy curls to the shimmering shade of purplish plum, everything about hairstyle oozes glamour. Be warned that such a big, bouncy style and vibrant shade of red will turn plenty of heads wherever you go. With this in mind, this jaw-droppingly stunning, sixties inspired hairdo is best suited to confident trendsetters who love being the centre of attention. We all love super long hair, but one of the biggest problems many girls face, is that it can sometimes look dull or lifeless. 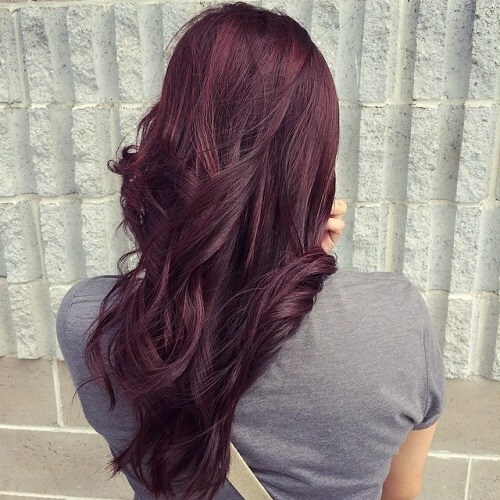 Spice it up with a glossy shade of violet tinted mahogany and adding some random curls. This look is all about the layers and the soft violet shade. 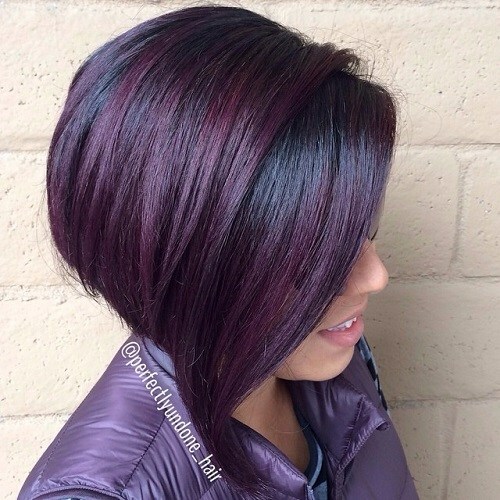 The choppy layers in the length of the hair add a whole lot of body and the subtle splashes of pastel purple add a unique twist to mahogany hair. 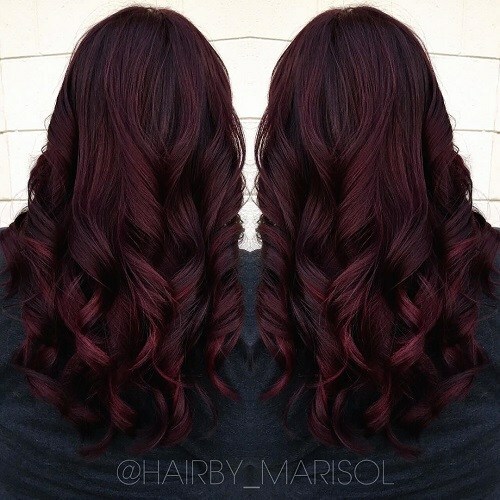 The big, bouncy waves in this long burgundy hairstyle are a guaranteed way to turn heads wherever you go. 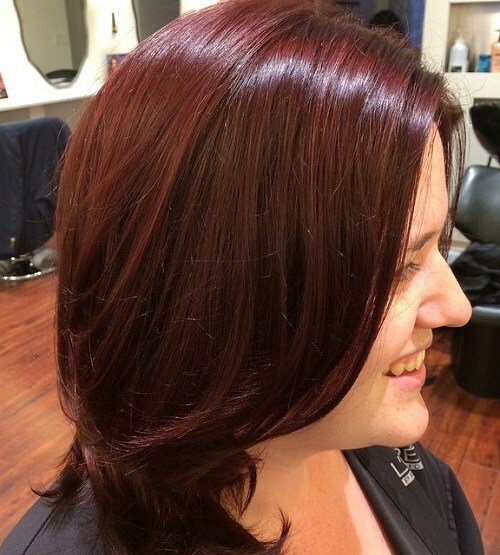 Shake up your look by adding one steak of vibrant red to the layers at the very front of your hair. This will frame and brighten up your whole face, and the mahogany base shade will make it stand out even more.